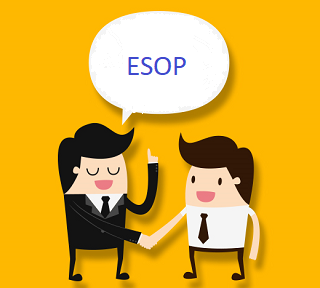 ESOP is an acronym of Employee Stock Ownership Plan or Employee Stock Option. ESOP is offered by the company to their employees. ESOP can make you crorepati. I am not joking! There are many stories of crorepati employees of Infosys, Wipro, Flipkart, and many other big organizations. At the time of opting for ESOP probably they were not knowing about power of equity but after becoming crorepati they have realized the power of equity. If you are doing job and employee is offering you a stock option, you should go for it. Here is detail explanation along with benefits offered by ESOP. ESOP is Employee Stock Option. It is an option given by the company to their employee. In this option, employees get the right to purchase a certain number of company’s shares at the predefined price. This offer is given only for a specific period or periods. ESOP is one type of performance reward offered to the loyal and hardworking employees. Many companies use ESOPs as a retention tool. ESOPs are generally offered to an employee at the discounted rates. It is given in parts and there is fix vesting schedule. The period for which employees have to wait before exercising a right to buy the share is known as vesting period. If an employee doesn’t exercise the option it will lapse, and the employee does not get any rights. Many companies in different sectors offer ESOP to employees to attract and retain talent. How employees can benefit from ESOP’s? ESOP’s helps employees to accumulate wealth. It can act as a good tool to generate a retirement corpus. It is advisable to exercise ESOP option when shares are trading at a lower price. In simple terms, you need to follow the strategy of buying a share at a lower price and sell it at a higher price to gain higher profit. Before opting for ESOP one should understand that there is a risk associated with exercising this stock option. If the company does not perform well in the future, you may end up losing money. Apart from that, in most of the cases, a stock option is given as a part of a compensation package. Acceptance of a stock option will reduce fixed pay. One should do a cost-benefit analysis before accepting the stock option. You should consider factors such as reduction in salary, expected cash outflow, tax implication and share price at the time of exercising this option. What are the advantages and disadvantages of ESOP? ESOPs can be a very good tool for wealth accumulation in a long run. ESOPs are one of the ways to participate in the equity market for the newbie. Employees generally know about the growth prospects of the company, so they can decide their investment strategy. For the employer it will act as a good tool for retention of the good employee. An employer can give ESOP’s when a company is running out of cash. An employee will be more focus on delivering results as they have a stake in the company. Sometime ESOPs may backfire and give very low or no returns to the employee. ESOP’s does not provide liquidity. ESOPs comes with tax implications. In some of the cases company place condition of locking period or bond which will dilute benefits of ESOPs. ESOPs are taxed at two different stages. First is while exercising a stock option and second at the time of selling shares. On exercise option, the difference between that fair market value (FMV – determined by a category one merchant banker) and exercise price (EP) will be taxable as a prerequisite component in the salary of an employee. Based on the income tax slab, an employee needs to pay income tax. On selling of ESOPs capital gain tax is applicable. There are two types of capital gain tax namely (1) Long-term capital gain tax (2) Short-term capital gain tax. The applicable tax depends upon holding period of stock. If you are holding stocks for more than 12 months from the date of exercise, you need to pay long-term capital gain tax. A long-term capital gain tax rate is 10% and cess of 4%. Short-term capital gain tax is 15%. ESOP is very good wealth generation tool. However, before opting for ESOP one should do a proper analysis of risk vs reward. I hope this article helped you in clarifying your doubts about Employee Stock Option. Please share your comments and queries in the comment section given below.